Quake III Arena is a first person shooter and a direct sequel to Quake II. It was developed by id Software and ported to a variety of systems, including the Sega Dreamcast (whose port was handled by Raster Productions). The last game in this franchise to appear on a Sega system was Quake on the Sega Saturn. Quake III Dreamcast allows for a variety of control options. During online matches, keyboard accessories can be used for text chatting to other players, or team members during team games. There are five different control setups when configuring controls for your preferred device(s). Custom (C) - Allows you to map to any button or axis. 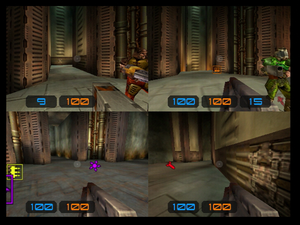 Quake III Arena features a Single Player component to help teach the player on how to play the game. Unlike previous entries of the Quake franchise, Quake III Arena was built to be primarily a multiplayer shooter. 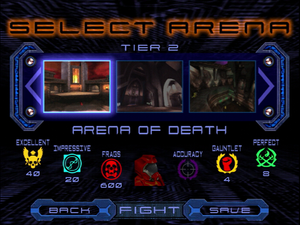 However there is an Arena Gauntlet mode that allows you to fight computer player opponents through five tiers. This was designed to ease players into playing against real opponents through a gradual learning curve to ease players into the faster paced gameplay. The Multi Player option allows up to four human players or up to three computer opponents play in an arena. Depending on how many local players are playing determine which maps will be available. Internet Game allows online play for up to four players, one player per system across all the maps and game modes available. Internet Game allows to chat between different players or team mates if the Dreamcast Keyboard is being used. 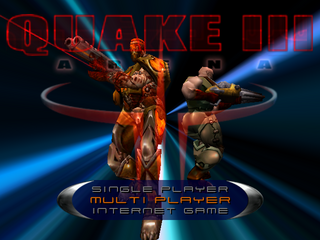 Because Quake III allows peer-to-peer connection, the US version can still be played online. Dreamcast users will need to connect to servers via an IP address with a working Broadband Adapter. Different items will appear in each arena that will help or hinder players. Players start off with the Gauntlet and the Machine Gun at the start of a match or when respawning. Different weapons and ammunition pick ups are spread out in each arena. The Gauntlet is the only weapon that does not require ammo, however can only cause damage and can be used in close range. Armor will help protect players by decreasing the amount of damage caused by other factors. Armor points can go up to 200, however will count down if it's over 100 points. Armor pick ups will stack over each other. Health pickups allow you to regain lost health during combat. Each spawn grants players 125 health, however health ratings that are over 100 will gradually count down. Green health bonuses will allow you to go past 200 health points while Yellow and Gold will bring you up to 100 points. During gameplay in both Single and Multiplayer modes come opportunities to be awarded with medals based on performance. Impressive - Award for making two consecutive shots with the Rail Gun. Frags - Awarded for every 100 frags. Accuracy - Awarded when accuracy is over 50% at the end of a round. Perfect - Award for surviving a round without being fragged. Quake III on the Dreamcast features down-sized and re-balanced levels from the original version, adjusted to take into account the maximum player count of four players offline and online. A number of levels have also been omitted in this version, and some levels are not available in certain split-screen modes due to RAM limitations of the Dreamcast hardware. Four players can play online at the same time on all the levels in the game. 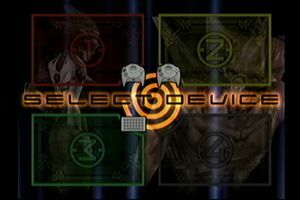 The allowed amount of players for each level in split-screen is listed below, along with the exclusive levels made just for the Dreamcast version. Quake III on Dreamcast supports four players, but takes several technical measures to help keep a steady framerate. Can also be played in Tournament and Team Deathmatch modes. Original Dreamcast Music by: "Razor"
Main article: Quake III Arena/Magazine articles. The Dreamcast port of Quake III Arena is capped at 30fps. It runs on a Dreamcast port of the id Tech 3 engine used for the original PC version of Quake III Arena. Raster Productions made several optimizations to the engine for the Dreamcast hardware, allowing it to run at a smooth frame rate. However, it was not entirely optimized for the hardware. Quake III Arena rendered up to 10,000 polygons per scene, at 30 FPS on the Dreamcast, which was a fraction of what other Dreamcast games rendered while maintaining 60 fps (e.g. up to 52,000 polygons per scene for the backgrounds and 9246 polygons per character in Dead or Alive 2). Nevertheless, Quake III Arena was more optimized for the Dreamcast than Unreal Tournament, with the Dreamcast version of Quake III Arena having more polygon geometry, stable frame rate and dynamic colored lighting. Quake III Arena can utilize VMU storage to save progress. It can carry five profiles and five save games for the Single Player mode. During gameplay, the player's avatar will show on the LCD screen. There are also maze mini games included when completing the Single Player campaign on any difficulty. Completing the maze will award the player cheats for user during offline Single and Multiplayer game modes. Each difficulty mode features a different maze and cheat.